Today we took an East Island Excursion to Cayo Icacos and Isla Palominos. A power boat took us to Icacos where we spent 2 hours exploring the island and practicing our snorkeling which was our second stop. This island and all of the neighboring islands were truly paradise! The water is the perfect shades of blue and green, clear and clean. The sand of the beaches is white with a bit of red mixed in - beautiful! The islands we explored today are secluded so people are not living on them altering their natural beauty! The second stop was snorkeling in a coral reef - as some of you may know, I am not a strong swimmer but I wasn't going to miss out on seeing the fish so I just went for it! Once I got my breathing down, I was good to go - we saw a bunch of fish, mostly medium-sized striped ones. I loved being able to get a look at the beautiful life under the beautiful water. The third stop was Isla Palominos - a little tiny island but still breathtaking! We snorkeled a bit more here and explored the beach. This excursion, including the boat ride, will be pretty hard to beat. 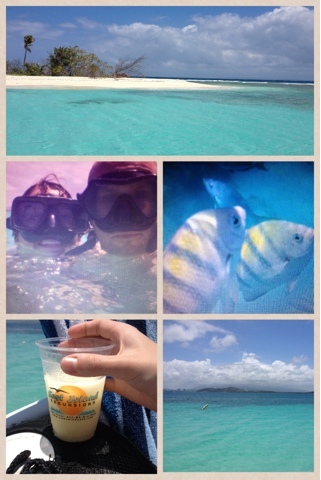 The water, the sand, the fish, the staff, the unlimited pina coladas, the lunch and fresh fruit - we had so much fun!